Which TDs did not pay the property tax by the final deadline? The deadline for the online filing of returns online was reached at 8pm yesterday evening. THE PROPERTY TAX deadline was extended to last night – but the extra time did not convince some of Ireland’s TDs to change their mind about paying the charge. Back in April, TheJournal.ie contacted TDs opposed to the tax to find out if they intended paying it themselves. Seven TDs – Joan Collins, Joe Higgins, Séamus Healy, Clare Daly, Luke ‘Ming’ Flanagan, John Halligan and Thomas Pringle – told us they would not be paying. The online returns filing deadline was extended from midnight Tuesday night to 8pm last night. In April, TheJournal.ie‘s Hugh O’Connell contacted Irish TDs to find out who intended on paying – and this week we contacted the TDs who said they weren’t going to pay to find out if they had changed their mind. Thomas Pringle TD’s office said the TD wouldn’t be paying the tax. Clare Daly TD’s office said the Deputy had no intention of paying the tax. 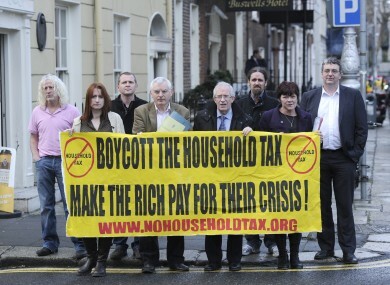 Joan Collins TD told TheJournal.ie that she opposes the tax and would not be paying it. She said that while campaigning against the tax, she has made it “quite clear” people face consequences, but that “many people are determined not to pay it”. “People have to make the decision themselves,” she said. Collins also criticised trade union leaders for their stance on the property tax. “This is going to impose huge hardship on people,” said Collins. Séamus Healy TD said he is “absolutely opposed to this tax” as he believes it is “completely draconian and completely unfair”. He will not be paying it and said as far as he is concerned, the government does not have a mandate for the tax. He realises that the tax could be taken out of his salary if he does not pay, and said he sympathises if people feel they have to pay because they cannot afford the penalties if they do not pay the charge. He encouraged them to “continue their opposition to it” even if they do pay, and said that the government parties should be targeted in the local and European elections next year. John Halligan TD’s office said he had no intention of paying the tax. Luke ‘Ming’ Flanagan TD confirmed that he intended not to pay the tax. Joe Higgins said that he will be “sticking with the boycott”. He said he is not concerned for himself, but is concerned “that the Revenue absolutely must not victimise poor people and low-middle income earners”. He said people see the tax “as a burden too far”. Meanwhile, Sinn Féin TDs remain opposed to the tax, but a spokesperson said it is up to the individual deputies to decide if they wanted to pay the tax or not. Following consultation with her family, Mary Lou McDonald TD will be paying the tax. However, Pearse Doherty TD will not be paying it, the spokesperson said. Doherty knows that the money will be taken from him anyway, said the spokesperson. In April, he told TheJournal.ie that: “It’s a non issue for us [Sinn Féin], if you don’t pay it’s going to be deducted from our salaries by Revenue so I will be complying with local property tax”. Doherty has launched a bill to repeal the property tax, the Financial Local Property Tax Repeal Bill. The party’s spokesperson said Sinn Fein did not encourage people not to pay the tax and that all members were encouraged to consult with their families on the issue. Email “Which TDs did not pay the property tax by the final deadline?”. Feedback on “Which TDs did not pay the property tax by the final deadline?”.